UK high street sneaker store Size?’s strong relationship with Nike continues with this information source for all things Nike. Aptly named ‘Wize?’, this new section of the Size? website explores the world of Nike through photography, features, articles and film, providing an excellent source for anyone to browse. Featuring sections on Nike’s heritage, history of their products and design innovations, this is the perfect place to obtain a great deal of information on Nike’s output for newcomers and also for old timers to use as a refresh. Wize? 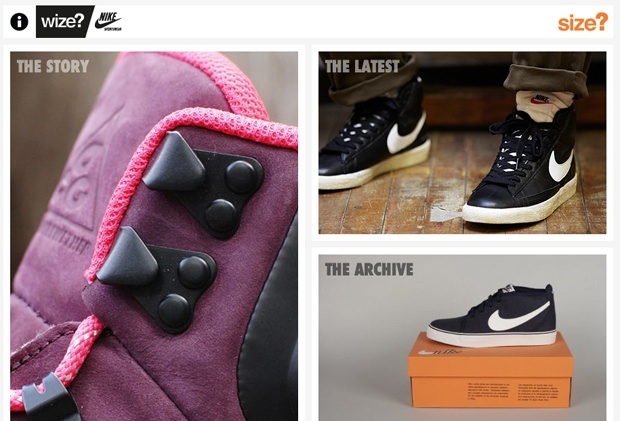 also has an archive of past releases with a section for the latest releases, which is a great reference to have for any Nike geek. Wize? is an excellent beginners guide to Nike and the companies heritage, and should encourage more people to explore and research Nike’s history in more depth, which is never a bad thing. Check out Wize? here.